1. Thread the meatballs and vegetables alternately onto 4 skewers. Mix the oil and harissa together and brush over the skewers. Place under a preheated grill for 10-12 minutes until cooked throughout, turning occasionally. 2. 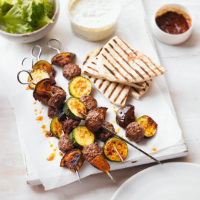 Serve the kebabs with the toasted pitta, salad and a spoonful of tzatziki.